Every girl needs to have that little black dress. 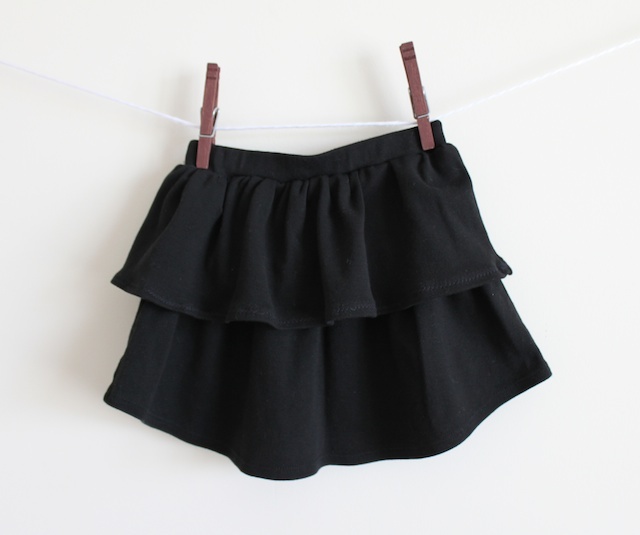 And now you will need a little black skirt. I love that this skirt is voluminous. My last skirt for skirt week is like the others, repurposed. And can I say that it has been an enjoyable skirt week, but endless hours of hard work making the skirts, taking pictures, editing pictures and writing up the tutorials. Whew. I hope to see everyone’s skirts from skirt week in our Flickr group. Come on. 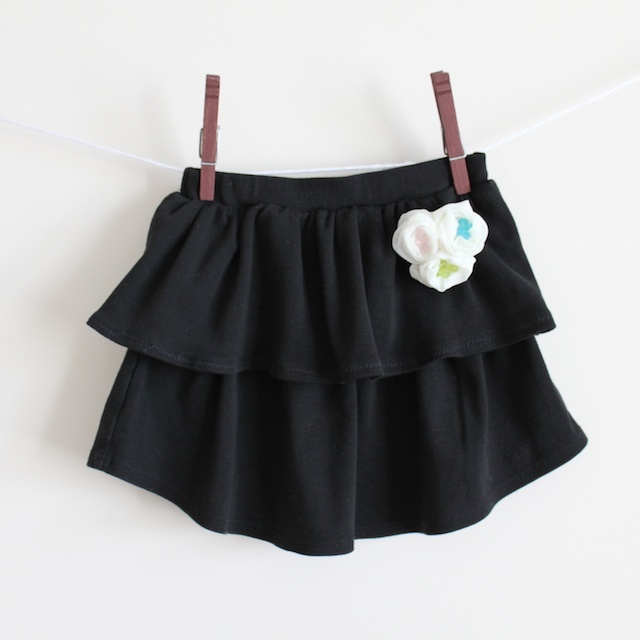 Show off your cute skirts! Since this is in black, I hope you can see the pictures OK. 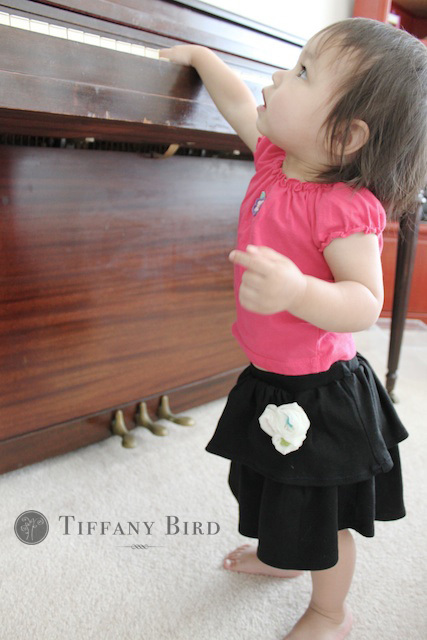 This skirt was for my 1 year-old Elle who wears between 12 to 18 month size clothes right now. If you are making this for a bigger child, you can use men’s shirts. 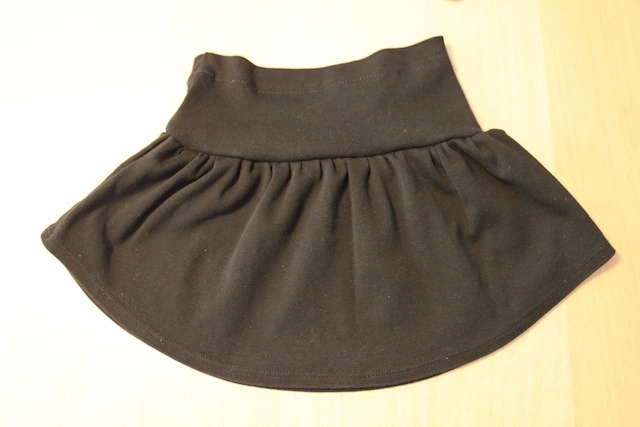 If you want to make this for yourself, purchase some jersey knit fabric or whatever fabric you like. 1. I used chalk to mark where to cut on the black shirt. Grab one of their skirts and take measurements from that. These were the measurements for a 18-month size. Keep the bottom two cuts as one pieces. Don’t cut the sides. 2. Take the waist pieces and have the wrong sides together. 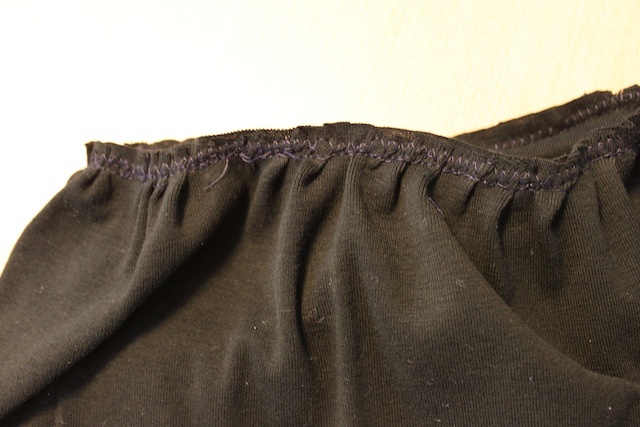 Sew the two sides with a straight line then zig zag (or use a serger if you have one) the seam. 3. Fold and iron the elastic casing at the top of the waist piece at 1 1/8 inch down. 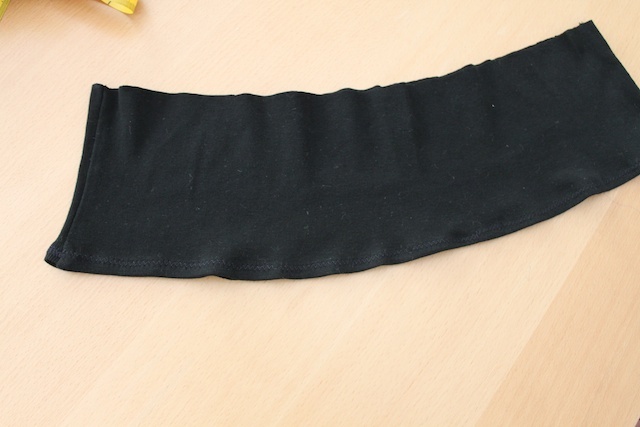 Have the fold go inside of the skirt. In the picture I have the wrong sides out. 4. 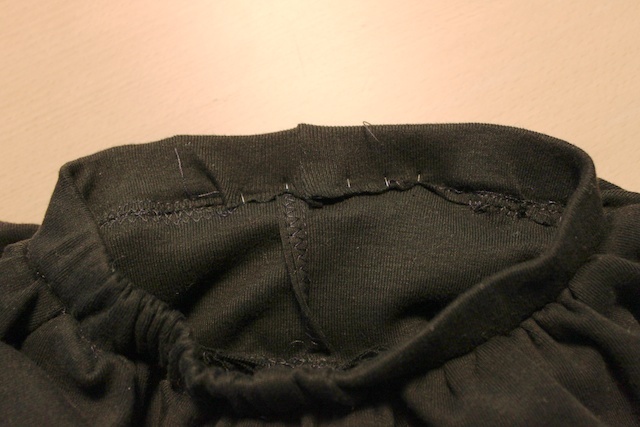 Straight stitch the casing close but leave a 1/4 inch seam that you’ll zig zag stitch over later. 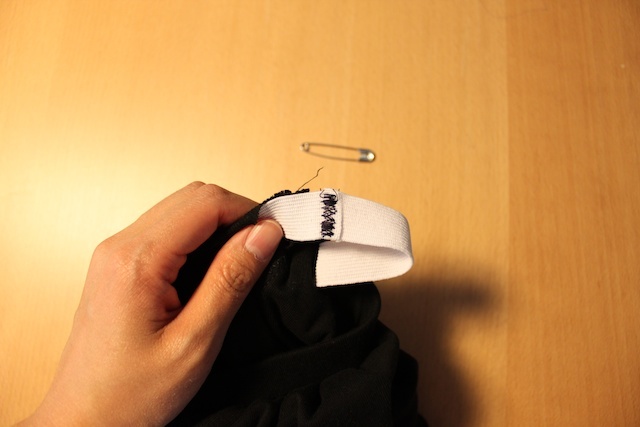 Make sure you leave a 1-inch opening for you to put the elastic through. 5. 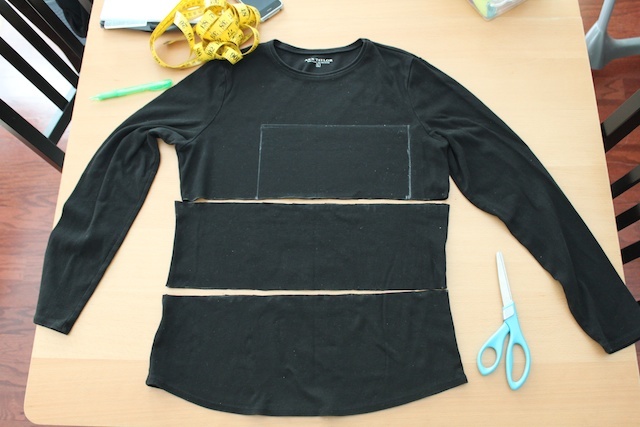 The top ruffle piece is from the middle of the shirt so you’ll need to fold one of the length sides at 1/4 inch in on the wrong side and zig zag stitch over it to create a hem. 6. Do a basting stitch at the top of both ruffle layers at 1/4 inch. 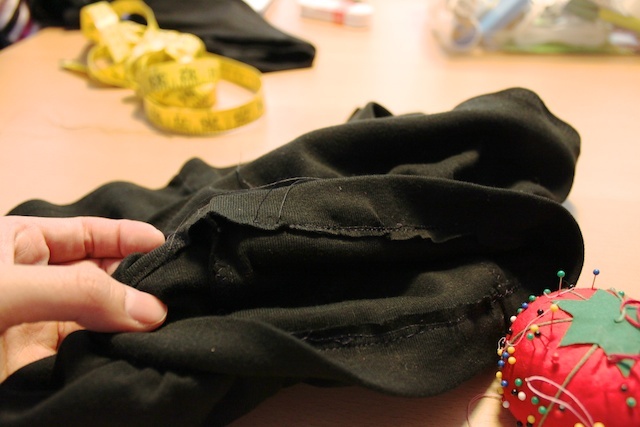 Then gather the layers to fit the size of the waist piece. 7. 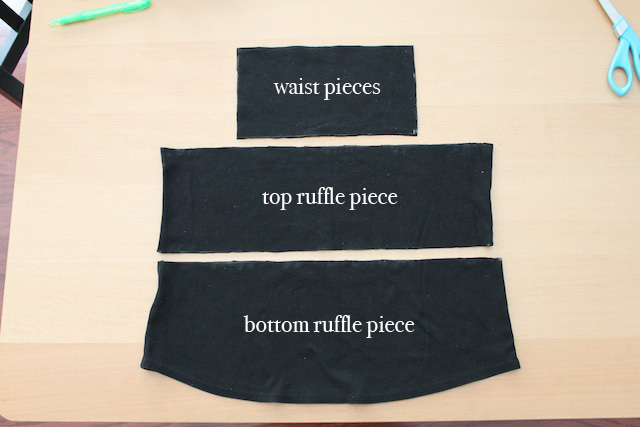 Attach the bottom ruffle piece to the waist piece first. Have the waist piece right side out. 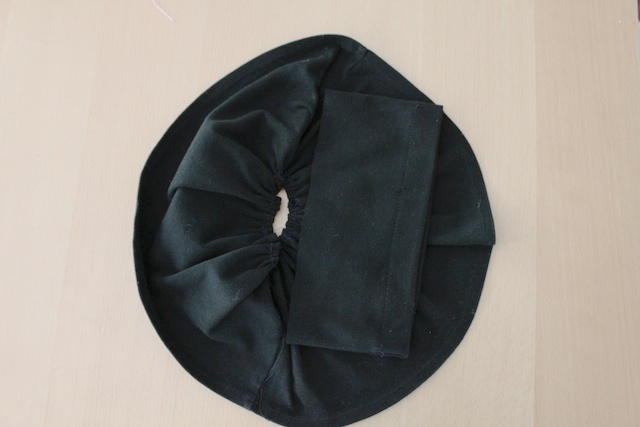 Place it inside of the bottom ruffle piece that is wrong side out. So you will have the right side of the waist piece touching the right side of the bottom ruffle piece. You will also want to match the side seams to it lines up. Then pin it all in place. 8. 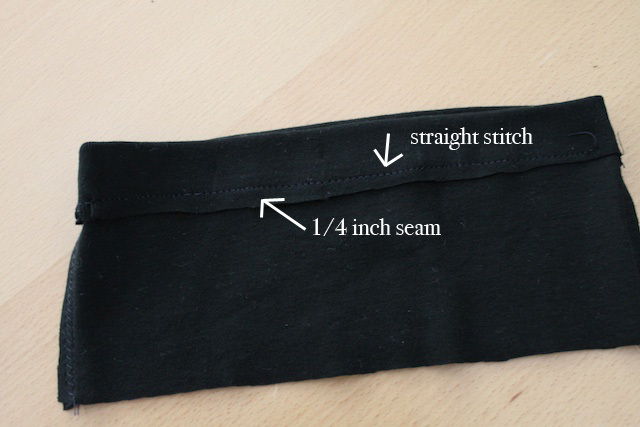 Do a straight stitch then zig zag stitch the seam to keep it in place. 9. 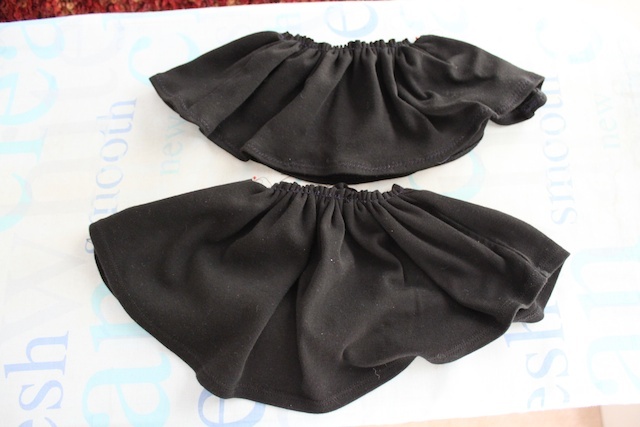 Now that the waist and bottom ruffle pieces are together, we are going to attach the top ruffle piece. This is a little trickier. Have the waist piece right side out and the top ruffle piece wrong side out covering the elastic casing part of the waist piece. Then using your fingers to feel for the elastic casing seam, match the basting stitch of the top ruffle piece to just below the stitch of the elastic casing. Pin in place all the way around. 10. 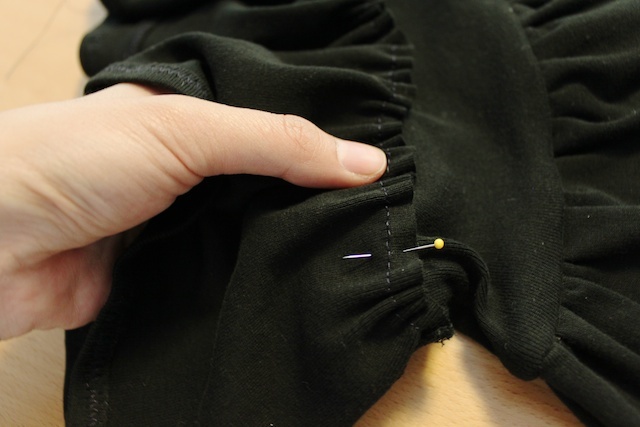 Before you sew the top ruffle piece in place, make note of where the opening for the elastic is. You will want to leave an opening in the top ruffle piece at that same place. 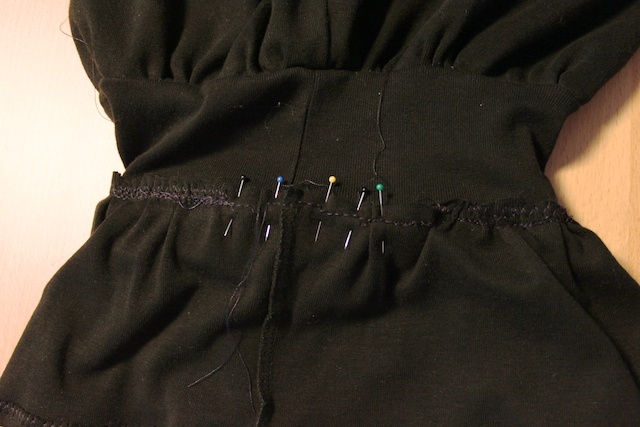 Do a straight stitch then zig zag the seams. Remember to have an opening at the same place as the elastic casing opening. You will see why in step 12. 11. 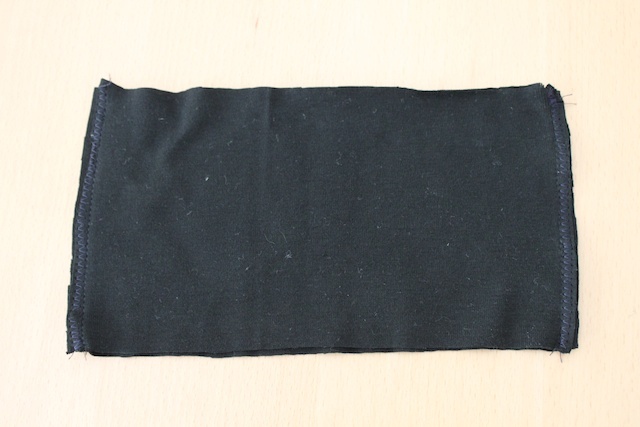 Slip the elastic through the casing at the opening. 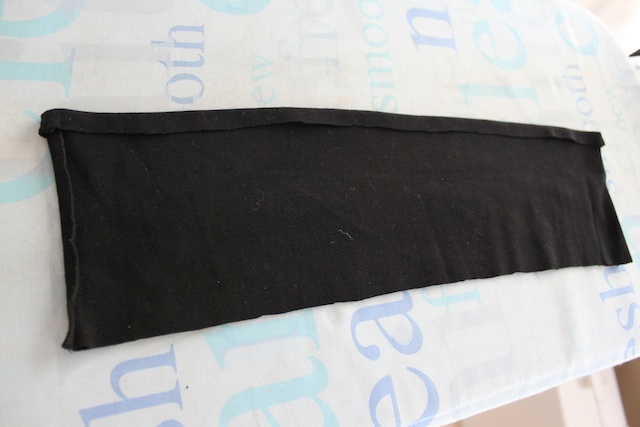 Then sew the ends of the elastic in place. And pull it through the casing. 12. 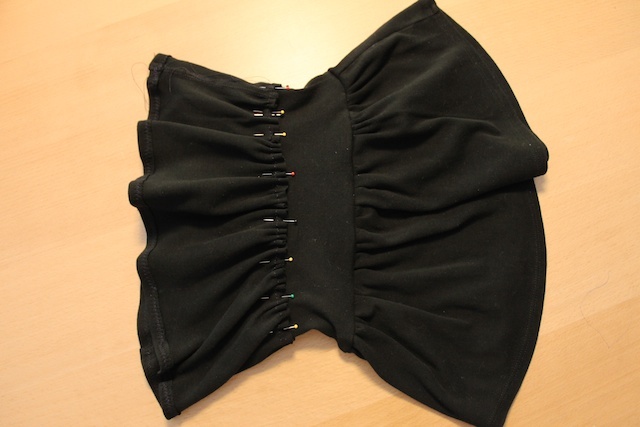 To close the opening, you are going to pin the opening close but you’ll pin close both openings (one from the casing and one from the ruffles). The reason you left an opening in the ruffle piece that matched the casing opening was so you don’t sew the casing opening close. And that’s what you’ll do now. 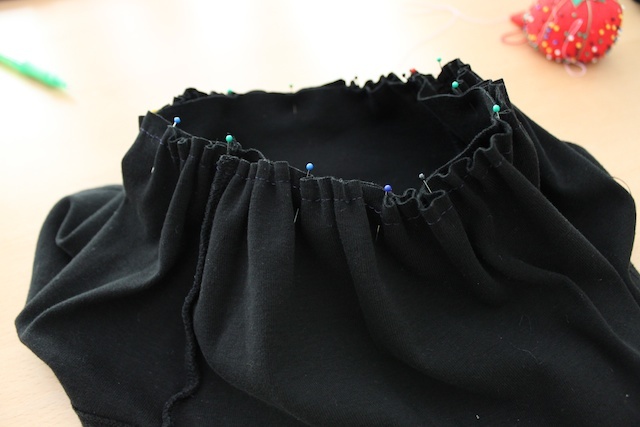 Sew both openings close by sewing on the ruffle side (top ruffle piece is flipped back wrong side out). 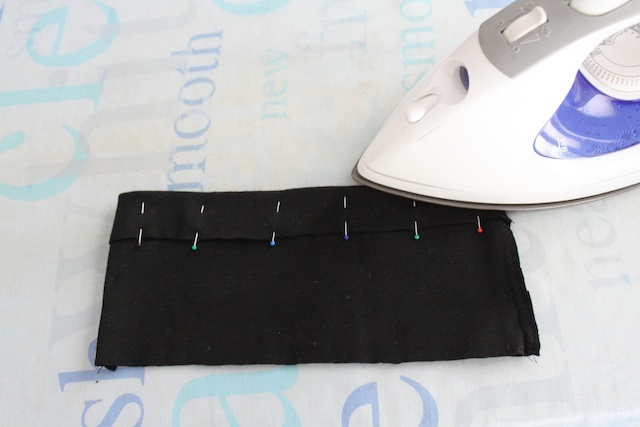 Do a straight stitch then zig zag like you did before. And you’re done. Add a brooch to it to jazz it up. I will have a tutorial for this brooch coming soon. » Tell me… Did you enjoy skirt week? What was your favorite part of skirt week? And don’t worry about all the estrogen here on SMM. I am hoping to come up with some guy stuff soon. That is just so cute!! Love it!!! Great! Love the flowers. I have so many tshirts I could work with… Come summer time at the end of the year – I will have to get on and make some. Thanks for all the great tutorials. I just found your blog and I am in love! Your tutorials are easy and oh so cute! These were things I had in my mind as a new sewer and i am so excited to try them! Thanks! Adorable!!! Your tutorial was great! Cute! 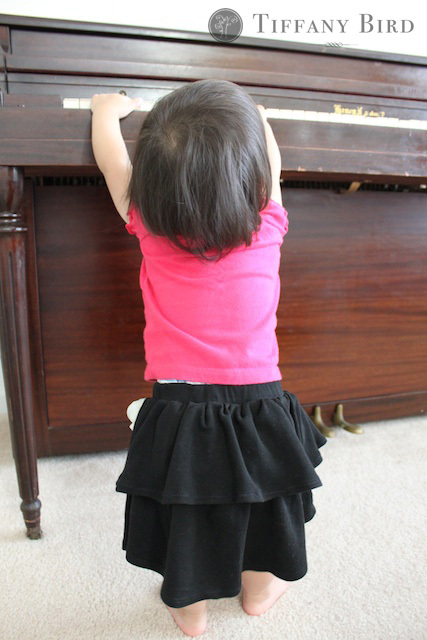 I’m not sure my sewing skills are as good as yours, but I will definitely have to try making some of these skirts for my little girls. Great tutorial. I love the skirt. 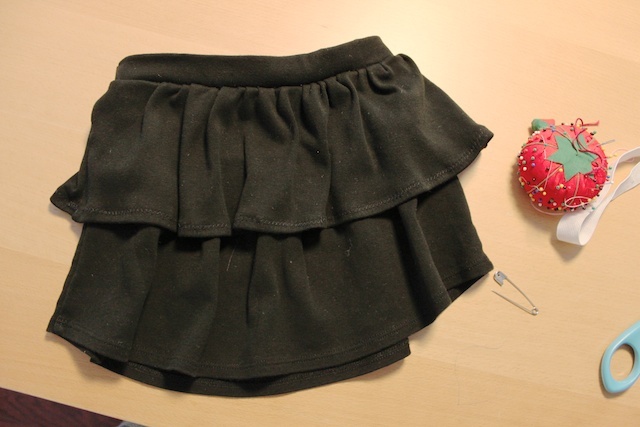 could you please explain what sort of formula you used to get the measurements for the different pieces of the skirt?(i.e. waist pieces and ruffles). 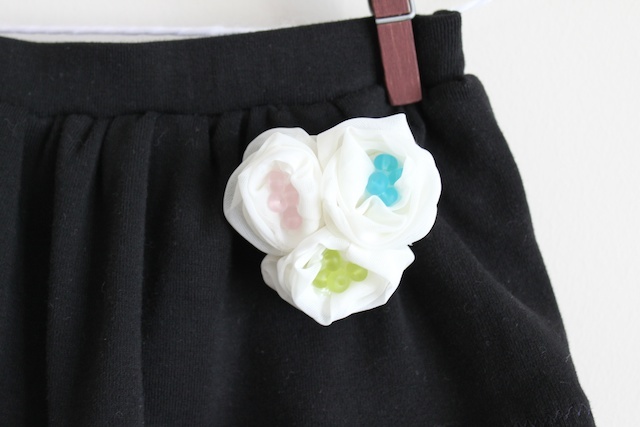 I would like to make this skirt for myself and I wear a medium in Junior clothing. lovely skirt. 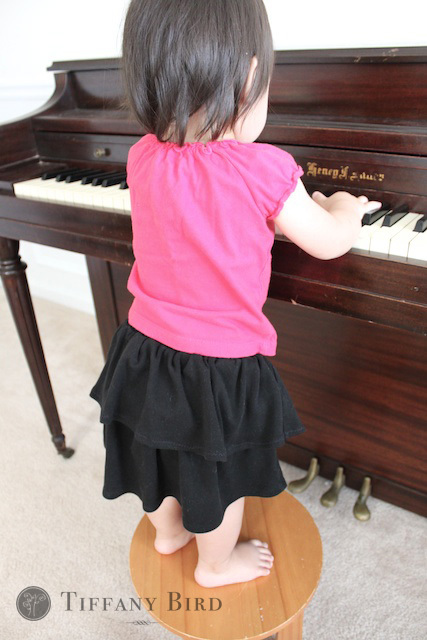 would luv to do skirts for my 2 little girls………thanks for posting…….simple and easy step by step explanation is very useful …….kudos again………………gr8 job …. what is basting stich. i am a beginner learning to sew for my little ones. i have a basic tailor model sewing machine at home..